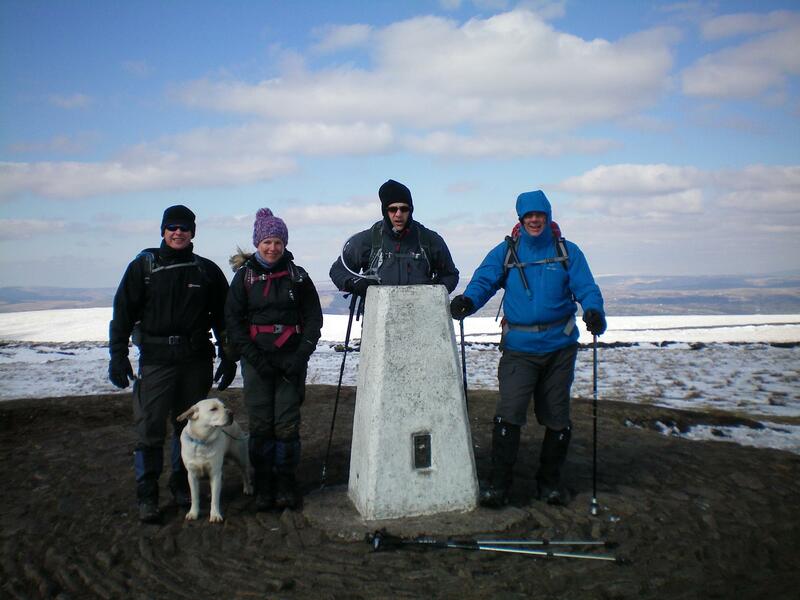 A sunny but cold Good Friday holiday had us stepping out to tackle Pendle Hill. It’s not a particularly high hike at 557 metres (1,827 ft) but it does offer a steep ascent when approaching in an anti-clockwise route from the village of Barley to the east. Although it’s less than 20 miles away from home it’s the first time I’ve been in this area of Lancashire. Jeff and I car shared and met up with Paul, Debbie and their energetic 1 year old Labrador Wallace. A quick cup of tea from the Barley Café set us all up nicely before we headed off through the village toward the hill. The first mile of the walk is almost flat as you follow a stream through some farmland up towards the base of the hill. From there we took the right hand path to the summit which consists of very steep steps which as we rose became more and more snow covered. The wind really picked up of the final 100 meters of ascent, it was biting cold. Once on the top we sheltered behind a stone wall to have an early lunch and grab a drink. Visibility was superb and we had stunning views over towards Yorkshire where could clearly make out our previously walked Pen-Y-Ghent and Ingleborough mountains in the dales. Once rested it was good to get moving again and warm up as we climbed back over the wall and off to the trig point at the summit plateau’s highest point for quick team photo opportunity. My navigation was a little off as we began the decent and I missed our planned path and cut the corner to bring us down off the hill on a shorter route. Note to self – don’t assume, take a compass bearing to check! Unfortunately the ground was pretty boggy in places as we got lower down and one of us slipped and took a knock to their ankle. 2 ibuprofen and using walking poles for stability seem to help and we all took a gentle pace down onto firm ground. We followed a hard surface track alongside lower Ogden Reservoir back into Barley village where we finished as we started with a drink from the café. I’ve posted some climb stats and facebook photos. All in all a short walk but with a good steep accent to help our training. This could be another candidate for a weekday evening walk once we get sunlight later into the day as the summer approaches.